Last month I shared a recipe for one of my favorite autumn cakes. Since I have posted many other favorite season-specific cakes in the past (rhubarb cakes in the spring...stone fruit in the summer...dried fruit and nuts in the winter...) it should come as no surprise that I would have more than one or two cakes on my list of fall favorites. 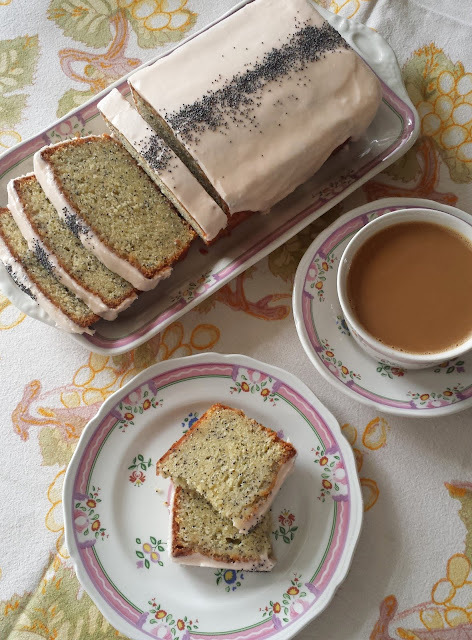 I have been making the cake I am sharing today for many years...so long in fact that the cookbook from which it comes (The Victory Garden Cookbook) is out of print. It is made with sweet potatoes (which are coming into season right now), chocolate and spices....and it is simple and delicious. In character this cake is like a loaf cake or a tea bread. It is moist with a fine, even crumb. It slices beautifully into thin slices...or fat wedges. I serve it as a dessert...but it is such a large cake there are always leftovers and it makes a pretty fine breakfast. The slices freeze well too...making it appropriate for keeping on hand for a sweet something with afternoon coffee or tea. The recipe directs you to bake it in a large tube pan (the type of pan used for Angel Food Cake)...but it can be made in two 8-cup loaf pans instead. When I teach this recipe in my Winter Squash & Sweet Potatoes class, I always make the tasting cake in loaf pans. It is easy to get a lot of even, thin, tasting-sized portions in this form. For this reason, the loaf style would also be perfect for a pot luck or a church coffee hour. You might think that this cake could just as easily be baked in a Bundt pan, but I would not recommend this. Even large Bundt pans will only have a 12-cup capacity. This cake requires a 16-cup pan. It may look like it will fit in your Bundt pan, but it will tend to want to overflow while it bakes. Even if I happened to have a large enough Bundt pan, I would still choose to make this cake in a single tube pan or two loaf pans. The exposed surface of the finished cake is an attractive, rustic coil of dark orange and deep chocolate brown. Because a Bundt cake is always inverted for serving this marbled surface would be hidden from view. Both the tube and the loaves are presented "right-side" up, so the pretty top of the cake remains on display. In all likelihood this cake will remind you of pumpkin bread. But you shouldn't be fooled into thinking that it can be made with pumpkin. It cannot. If you have ever tasted plain roasted sweet potatoes and thought to mentally compare it with the flavor of plain pumpkin purée, you will know that sweet potatoes are naturally much sweeter than pumpkin. The recipe takes this into account; there is not enough sugar in the cake to support pumpkin. Since it is much more convenient to open a can of pumpkin than it is to go to the trouble of roasting and puréeing a few sweet potatoes, the temptation to do so is great. But I know from experience that you will be disappointed. Even with this extra step of preparing the sweet potatoes, this is still a very easy cake to make...and definitely worth that little extra effort. As with most cakes of this style, it really needs no special adornment....a sprinkling of powdered sugar is sufficient. That said, there are many things that would compliment this cake nicely. A glaze of some kind would be good...either a simple powdered sugar-based glaze or a chocolate glaze. A crème anglaise or a chocolate sauce would be delicious, too. To be honest, I like it best served with a small scoop of ice cream. I have served it with vanilla...and several years ago I discovered I like it with Ben & Jerry's Heath Bar Crunch. This last time however, I made my own ice cream to go with it...a delicious espresso bean ice cream. And I have to say I think this was probably the best combination yet. Butter and flour a 10-inch tube pan or 2 8-cup loaf pans. Set aside. Whisk the dry ingredients together. Stir in the nuts and set aside. In a stand mixer, using the whisk attachment, beat the sweet potatoes, sugar, oil and vanilla at medium speed until very smooth and glossy. (Or, whisk by hand in a large bowl). Whisk in the eggs one at a time, making sure each egg is fully incorporated before adding the next. By hand, fold in the dry ingredients and the nuts. Scoop one third of the batter (about 21 oz.) into a separate bowl and quickly stir in the chocolate. Place the batters in the pan(s), alternating as for a marble cake. Then, with the end of a wooden spoon or the blade of a table knife, gently draw swirls through the batter to marbleize it. Don't over mix or you won't have a marble affect—two, zig-zag passes through the pan should be sufficient. Bake in a 350° oven until the cake springs back and a toothpick inserted in the center comes out clean—about an hour for the loaves and an hour and 10 minutes for the tube cake. Cool in the pan for 10 minutes before transferring to a wire rack to cool completely. Note: You will need about 2 lbs. of sweet potatoes to produce 2 cups of purée. Roast the sweet potatoes in a 400° oven. Prick the sweet potatoes in several spots with a fork or paring knife and transfer to a baking sheet. Bake until easily pierced with the tip of a knife, about 40 to 60 minutes—the potatoes will have begun to ooze a bit of sugary syrup when they are fully cooked. When cool enough to handle, cut open the sweet potatoes and scoop out the flesh. Purée in the food processor, or press the flesh through a sieve or mesh strainer. A sweet, orange fleshed variety of sweet potato (like Garnet, Jewel or Beauregard) will give the best result for this cake. Place the milk in a small saucepan. Add the coffee beans to the pan. Bring to a simmer. Remove from the heat, cover and let steep for 1 hour. While the milk is infusing, pour the heavy cream into a large bowl and refrigerate. Strain the milk into a clean saucepan (discard the coffee beans), add half of the sugar and return the pan to high heat. Place the egg yolks in a large bowl with the remaining sugar and salt and whisk until thick and pale yellow. Take the bowl of chilled cream out of the refrigerator and place a strainer over the bowl; set aside near the stove. When the milk boils, temper the egg yolks by gradually whisking in about a cup of the hot milk. Stir the tempered egg mixture back into the saucepan and place the pan over medium heat. Cook, stirring constantly with a heat-proof spatula, until the custard is thickened. (If you dip a spoon in the custard and draw your finger across the back of the spoon, a path will remain. Also, an instant read thermometer will read about 170°. The custard must be cooked beyond 160°, but must not go over 180°.) Immediately strain the custard into the bowl of cold cream. Stir in the vanilla. Place the bowl of custard in a larger bowl of ice water and let cool, stirring occasionally. Cover and refrigerate until deeply chilled. When ready to freeze the ice cream, whisk in the espresso. Freeze the ice cream in an ice cream machine according to the manufacturer’s instructions. Transfer to a freezer container and freeze for an hour or two—or preferably overnight—before serving. Makes about 1 quart ice cream. I've made this twice now and it is a keeper. It's absolutely delicious without being too sweet. Everyone who tried it enjoyed it too. Thank you for sharing. Thank you! I'm so glad you enjoyed the cake! I think it's a keeper too! Will a tube pan that has the removable tube and bottom work? I'm worried about it leaking out. I think it should work fine. My pan is a traditional Angel Cake pan...and it is in two pieces. The tube and the bottom are one piece and can be lifted up and out of the pan (which has a rim around the bottom...but no bottom). The cake has never leaked. It's a pretty stiff batter. I think it sets before it has a chance to seep through the "seam." Hope this helps!